A manufacturer of test and measurement equipment for GPS and other positioning technologies, Spirent wanted to increase brand awareness in the automotive sector. Working closely with Spirent’s marketing team and product specialists, we wrote this opinion article exploring emerging trends around positioning technologies in the automotive industry. 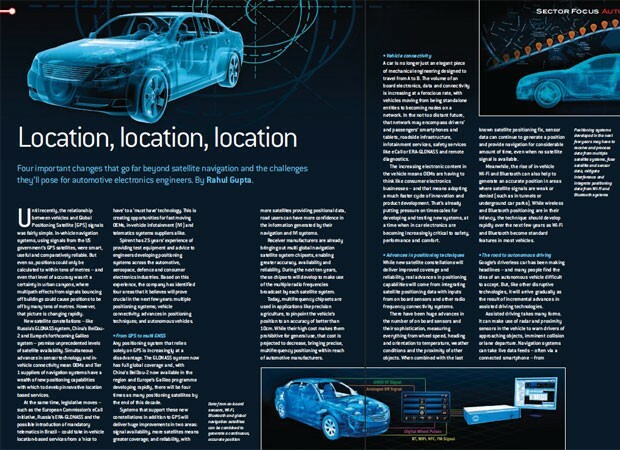 We identified an opportunity to place the article in an automotive-focused issue of New Electronics, read by some 16,000 electronics engineers, and we worked with the commissioning editor to ensure the article met the publication’s needs. The article was published in the February 2013 edition of the magazine and is also available to a worldwide audience online. Spirent has further extended the reach of the article by sharing it on relevant, automotive engineering-focused online forums and LinkedIn Groups.